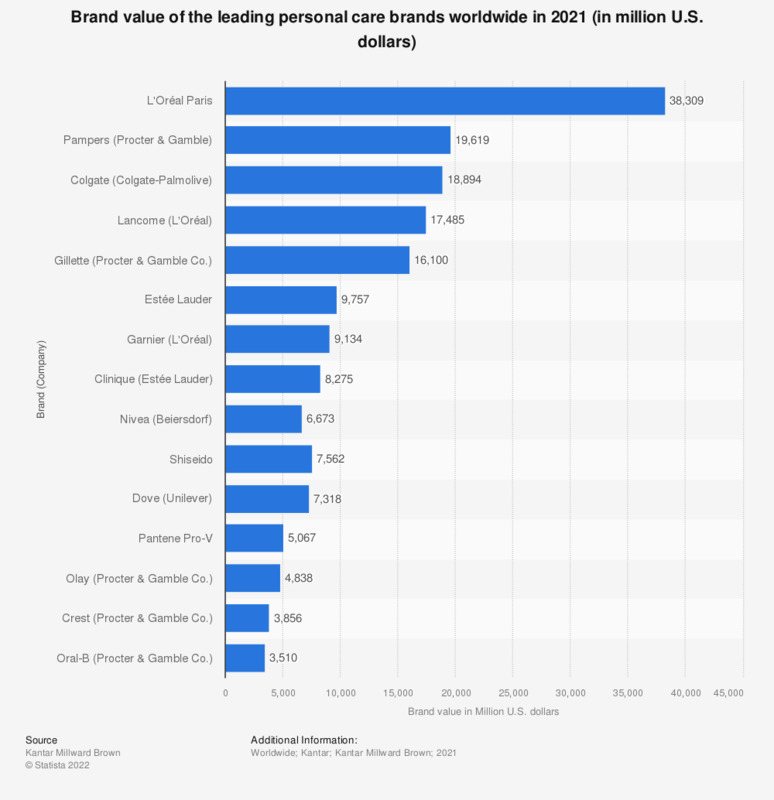 This statistic depicts the brand value of the leading personal care brands worldwide in 2018. In that year, the value of the Crest (Procter & Gamble) brand amounted to about 3.37 billion U.S. dollars. The personal care industry envelopes a variety of products, including makeup, fragrances, hair care and coloring products, sunscreen, toothpaste, and products for bathing, nail care, and shaving. These segments are complementary and through their diversity they are able to satisfy all consumers’ needs and expectations with regard to cosmetics. The industry overlaps with other markets like chemical, health care, and petroleum. The latter is important as personal care product raw materials, such as propylene glycol, come from petroleum products. Some of the leading personal care companies in the world include L’Oréal, Procter & Gamble, Unilever, Colgate-Palmolive and Beiersdorf. Over the coming years companies will continue to invest in eco-friendly practices. Manufacturers will also respond to demand for more natural products, widening their natural and herbal product lines. Marketing efforts will likely be increasingly geared to stress environmental protection through non-toxic ingredients. Everything On "Prestige/luxury cosmetics market" in One Document: Edited and Divided into Handy Chapters. Including Detailed References. Nail salons in the U.S.
Statistics on "Cosmetic brands: P&G"
U.S. population: Which brands of foundation / concealer make-up do you use most? U.S. population: Which brands of nail polish / nail care do you use most often? U.S. population: Which brands of lipstick and lip gloss do you use most often? U.S. population: Which brands of mascara do you use most often? U.S. population: Which brands of moisturizer / cream / lotion do you use most often? U.S. population: Which brands of facial cleansing / medicated products / toners do you use most often? Have you ever talked about matters connected to personal hygiene with any of the following people you know?